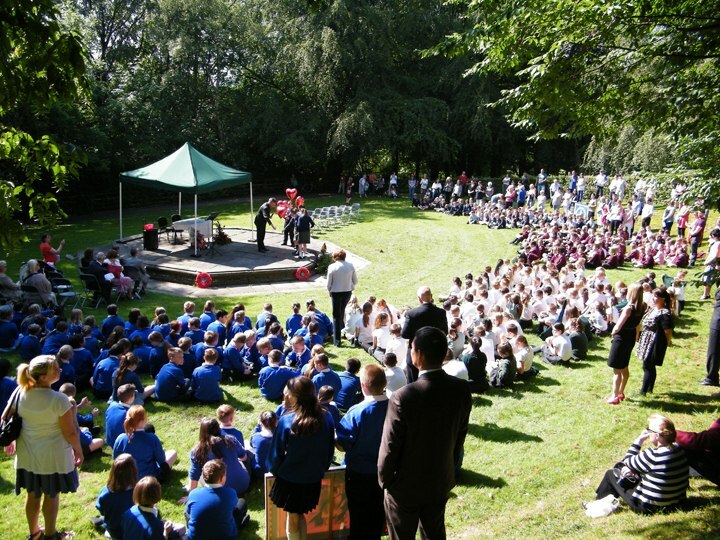 Almost 500 primary school children marched to the beat of a drum into the Memorial Park, Padiham, on Tuesday the 1st July, for a memorial service to remember local soldiers who gave their lives in the First World War. They marched as did the young men 100 years ago, the soldiers believing that the war would be over by Christmas, the children to honour the men they have been studying in the last few months. Pictures of many of the local soldiers who died were mounted along Padiham Greenway, the procession route. 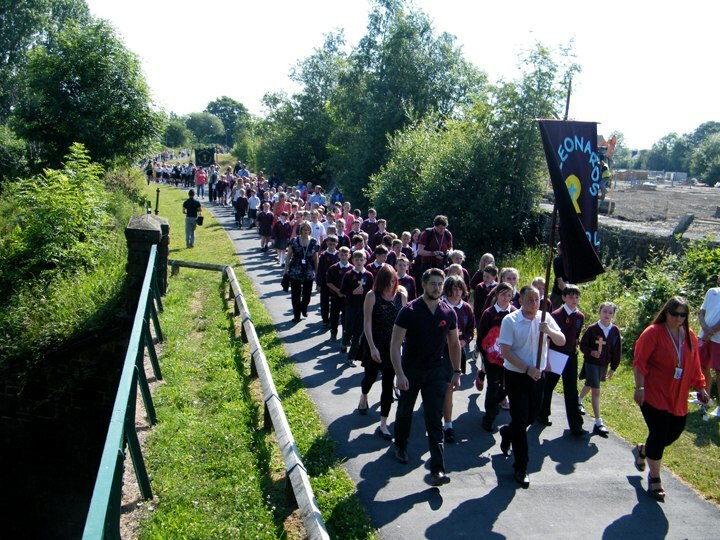 The pupils were from the four Padiham Primary Schools – St Leonards, Padiham Green, Padiham Primary and St John’s with each of the 500 children representing 40 of the 20,000 men who died on the first day along of the Battle of the Somme, the day on which the memorial service was held 100 years later. The service, led by the Vicar of Padiham, the Rev Mark Jones, including presentations by individual pupils giving the story of some of those who died, a poem, psalm or reading, and the St Leonards choir singing We Will Remember. Mr Jones spoke of the importance of remembering the past in helping to understand the present and then introduced the singing of a medley of songs – including some war-time favourites – by all the children. After his closing prayer and two minutes silence The Last Post was played by St Leonard’s teacher Tim Mason. 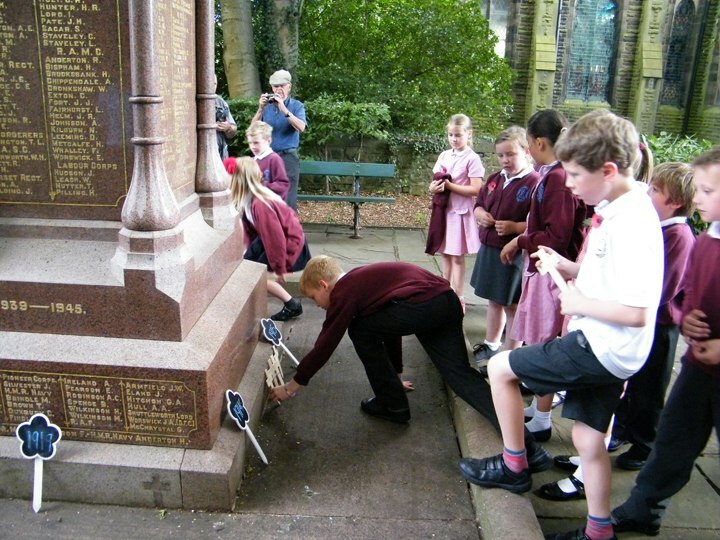 The children then made their way to the Memorial in Padiham Park and laid hundreds of wooden crosses, each identifying one of the local soldiers who died in that war. Eventually More than 4,000 crosses will be laid in the park, and in Towneley Park, to represent the 4,212 local men and one local woman who lost their lives during the conflict. “To see so many children marching to the beat of the drum and chanting ‘We will remember’ made this a very moving occasion. The whole experience has enhanced the children’s knowledge of the impact of war and how much we owe to those who lost their lives,” said Mrs Bev Holmes, headteacher of St Leonard’s Primary. Nice to see the young people learning and paying their respects for the fallen men from the towns and villages around from which they came from.